As a user enters text into a field it can be useful to automatically show and hide a scrollbar for the field, as required. In this example we will handle the rawKeyDown message. The rawKeyDown message is sent whenever a character key is pressed (and whenever a mouse scroll wheel is used). Note: We use a rawKeyDown handler instead of a keyDown handler because keyDown recognizes keystrokes that don't correspond to a character. For example, pressing the Delete key sends a rawKeyDown message, but not a keyDown message. When a rawKeyDown message is received the formattedHeight property of the field is checked. The formattedHeight is the total height in pixels that the text would occupy if it were all displayed at once. If the formattedHeight is larger than the field's height, the text is too large to fit completely within the visible area of the field. If the text won't fit a scrollbar should be shown, if it does fit the scrollbar should be hidden. 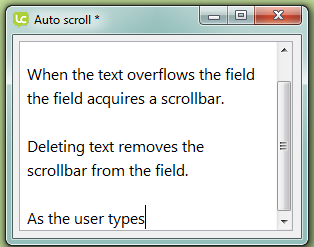 The vScrollbar property specifies whether a field or a group has a vertical scrollbar. The rawKeyDown message will be handled by the field script, allowing the handler to check the formattedHeight of the field and showing the scrollbar if necessary. If the rawKeyDown message is trapped, the keystroke is not processed, so it's important to pass the message to allow the keystroke to appear. If the rawKeyDown message is not passed the user won't be able to type anything into the field.